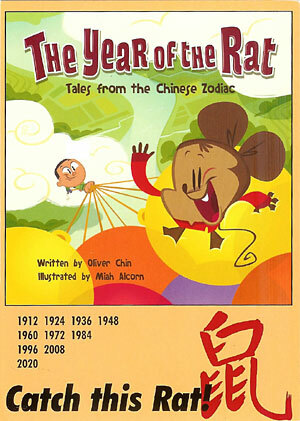 As you all must know by now, 2008 is the Year of the Rat in the Chinese Zodiac. People born in the year of the rat have special qualities that are personified in Ralph, our hero in this one book that is a sequel to The Year of the Dog and also, The Year of the Pig. His curious nature gets him into trouble and banned from the home of his human best friend, Bing. However, when Bing finds himself at the mercy of high flying balloons, Ralph’s ingenuity takes over and saves the day—and Bing. The book is hardcover and is 36 pages and sells for $15.95. It is probably more for the collector than it is for a children’s book. It is probably a two or three time read for the child and then back to the shelf. The illustrations are not as endearing as, let’s say, the Little Rat series.